Cognitive Behavioural Therapy is a talking therapy which research has shown to be effective in the treatment of a wide range of difficulties. It is recommended by NICE as the first choice in the of treatment in Depression and Anxiety. CBT is based on the idea that the way we feel is affected by our thoughts and beliefs, and by how we behave. 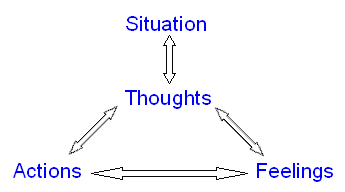 CBT helps you identify and change your own unhelpful patterns of thinking and behaving. Client and therapist work together in a structured solution focussed way to achieve agreed therapy goals. Anyone can benefit from CBT. However you don’t have to have a diagnosis of any condition to gain from CBT therapy as it can be applied to everyday situations. Those who receive the greatest benefit come along to therapy well motivated and willing to change. It does not matter what your background is as long as you have the desire to get better. Cognitive Therapy is a collaborative approach where the Therapist and the client work together to produce solutions to problems that may have troubled you recently or have been experiencing for many years. Copyright © 2019 Ballymena Cognitive Therapy Services.